Cut pumpkin in half horizontally and carefully peel it with a paring knife. Scoop out seeds and insides. Cube pumpkin into 1 inch cubes. Dice onion, pepper, and lemongrass stalk. Add oil to a large pot over medium heat. 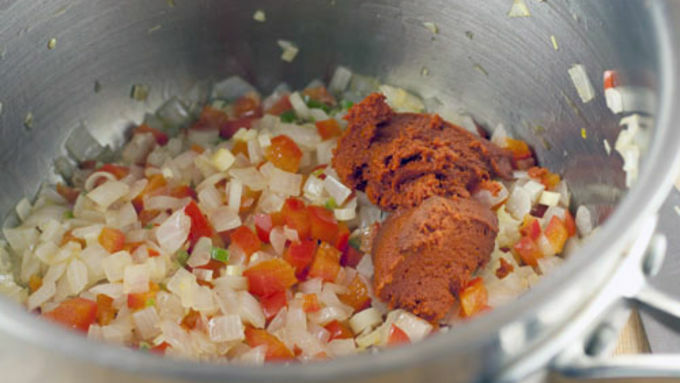 Once hot, add onion, peppers, and lemongrass and cook until soft, about 4 minutes. Stir in curry paste and cook for a minute or two. 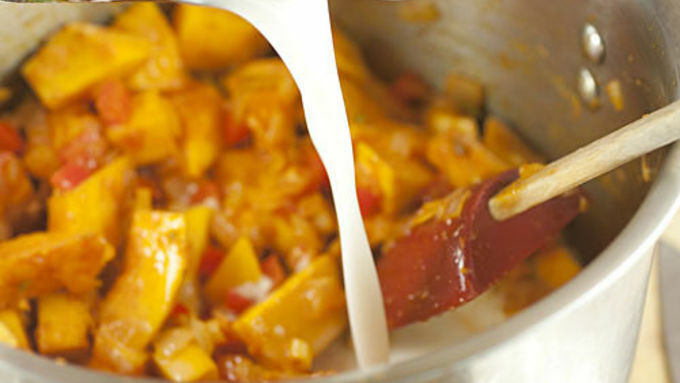 Add pumpkin and stir to coat pumpkin with curry paste. Cook for another minute or two. Add coconut milk, stock, and brown sugar to the pot and bring to a simmer. 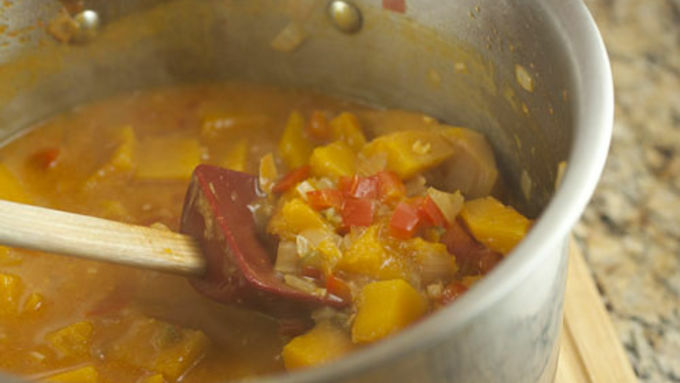 Simmer for about 10 minutes or until pumpkin is tender. 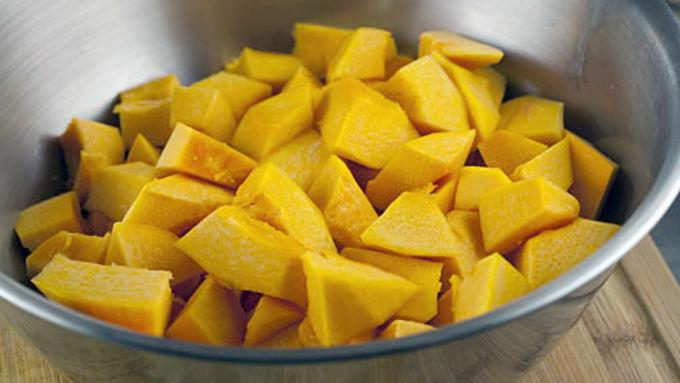 Lightly mash some of the pumpkin cubes to thicken the sauce. Serve curry over rice and/or with naan. As far as I can tell, Americans mainly use pumpkins for two things: Pies and carving. Any other use is generally frowned upon. Meanwhile, all over the world people are having many delicious (and savory) meals based on the orange gourd. 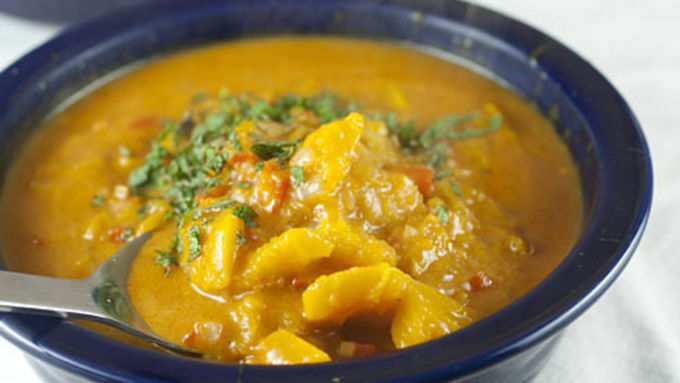 One of the best ways to use pumpkin in a dish besides pie is to make a pumpkin curry. 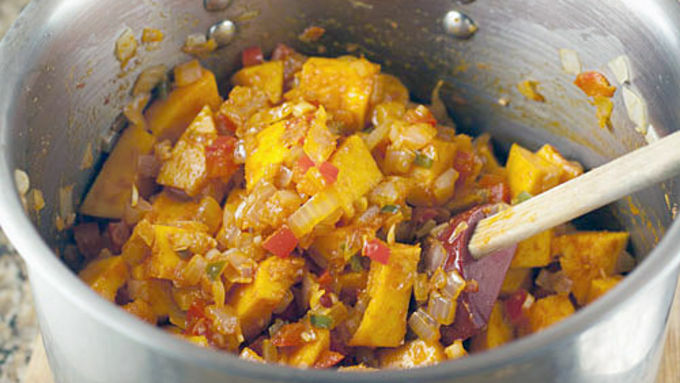 The slightly sweet pumpkin pairs great with the spicy curry. It’s a dish that I swear is worth the trouble of peeling and dicing a pumpkin. It turns out that we carve pumpkins here because 1) they look cool and 2) they are sturdy as all get out. 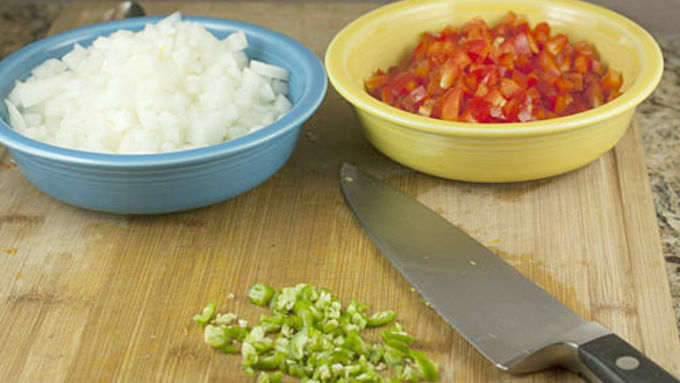 So unfortunately the hardest part of this entire recipe is just getting one peeled and diced. Don’t even try to do this with a standard vegetable peeler. It’ll never work and you’ll drive yourself crazy. The best way I’ve found to dismantle one of these suckers is to slice it in half horizontally (top right) and then use a paring knife to slowly peel around the outside of the gourd (bottom left). The skin is a lot thicker than you think. Don’t worry if you cut into the pumpkin flesh a bit. There’s plenty to go around. If you’ve never used lemongrass before, you’ll get how it got its name right away when you first use it. It looks like a thick grass. It smells like lemons. Easy enough! You can actually just throw the stalks in whole to season the dish, but I like to actually peel the stalks and dice up the softer interior part of the stalks. Meanwhile, remember those seeds you saved? Toss them with about a teaspoon of oil and Kosher salt and lay them out on a baking sheet. Bake them at 350 degrees for about 10 minutes for a nice little snack. Sorry. Got distracted. Back to the curry! Try not to overcook it or the pumpkin will turn completely to mush. You want the cubes to have some texture. 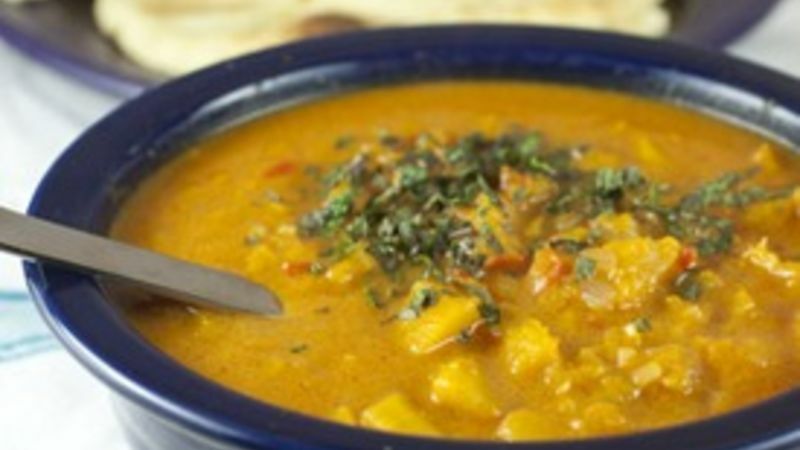 This is one of those vegetable dishes that even meat eaters will love. It’s completely filling, spicy, and just all around perfect for a cool Fall night. Serve it with some rice and naan bread and you’ll be in heaven.